The mobile mosque project planning committee (http://mobile-mosque-pj.com/), has been developing portable mosques to show hospitality toward Muslims. 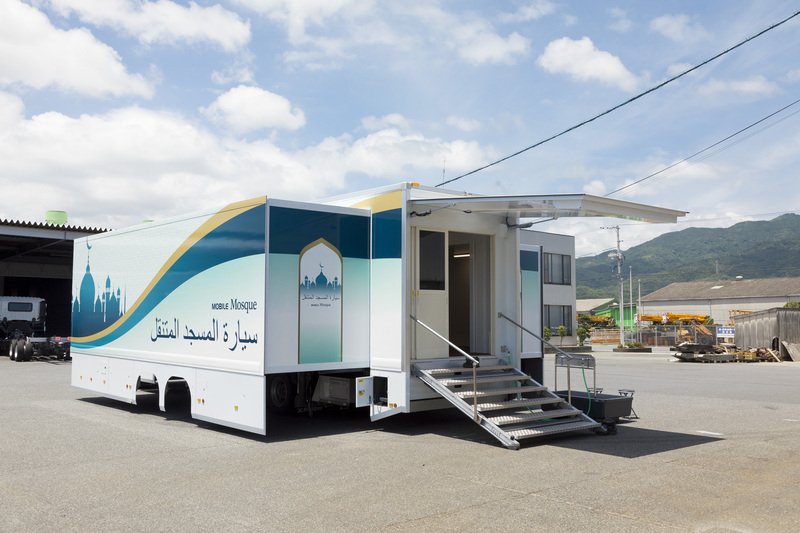 As part of tourism infrastructure facilities for world sports events coming to Japan next year and in 2020, the committee has now completed a“mobile mosque.” This project was launched when it was highlighted that there was an insufficient number of mosques amidst advancing consideration toward diverse guests of various nationalities, cultures, and beliefs. 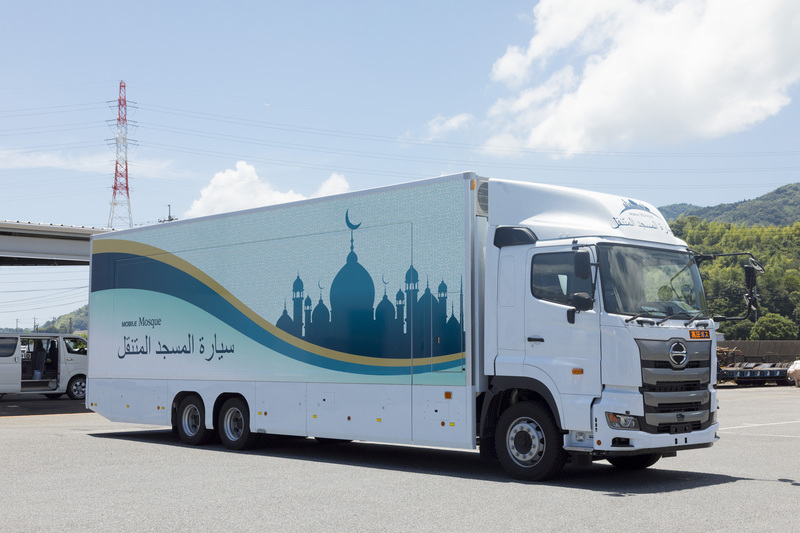 This mobile mosque was developed over the last four years. It is basically the modification of an already existing 25-ton heavy duty truck, with a widened trunk bed to establish a 48㎡ room where up to 50 people can worship at the same time. It is equipped with facilities such as a water basin for purifying and cleansing before worship and indicates Qibla (the direction of Kaaba at Mecca). It was originally designed to be a mosque for a large number of people and where formal worship is possible. Furthermore, by customizing the bed of this vehicle,it can be adapted for other various uses as well. For its debut, we are holding a Mobile Mosque Project Commemorative Ceremony according to the outline below. At this commemorative event, invited media can of course view inside the vehicle. There will also be various features such as styles of worship and halal cuisine. Also, on the day, Muslims who were child victims of the tsunami in Indonesia are coming to Japan to thank Japanese society for its help during the disaster, and they will also participate in the ceremony. We would greatly appreciate it if you could please come and cover this event. Now on the verge of the opening curtain for sports events drawing the attention of the world, we can say that the establishment of tourism infrastructures for visitors to Japan of various diverse nationalities, cultures, and beliefs is an urgent task in order to provide a fulfilling time during these events. Also, as we move forward with the construction of needed infrastructure such as athletic fields and accommodation facilities, one issue that has been raised is the consideration of Islam, or in other words, resolving the problem of an insufficient number of mosques. ※Nagoya Station⇔Venue: We will provide charter bus for the transfer between the station and the venue. Details will be provided at later date.